The Duomo of Milan is one of the most famous cathedrals in the world and an absolute must-see when visiting Milan. 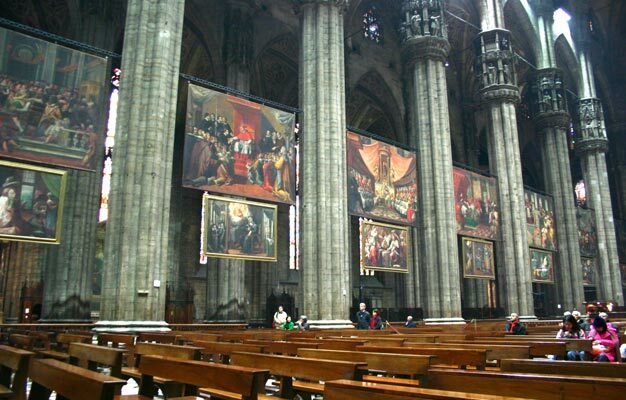 You can go directly inside the Duomo and unveil the mysteries kept inside that even the local Milanesi don't know! During your 2,5 hour tour your local tour guide will tell you about Milan's most renowned curiosities from the sundial trail to the ritual of the Holy Nail, to the story of the Apostle who was skinned alive and much more. 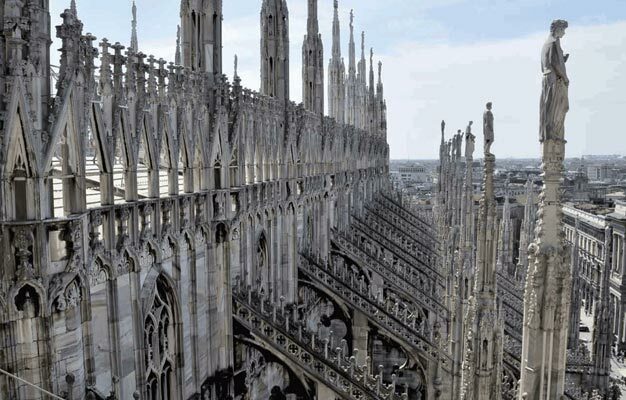 After exploring the Duomo from the inside, you will reach the cathedral's terrace by elevator. (Please note: There is not a skip the line option available for the elevator rides). From the terrace you'll have an incredible panoramic view over the city. You'll have plenty of time to take memorable pictures of the spires, to the new shining skyscrapers, to the iconic medieval towers and have a closer look at the incredible sculptures populating the Duomo. The sweet end of our fun and informative tour will be an Italian gelato and...a surprise lucky ritual! Shortly after your booking is complete your e-ticket send directly to your email, just print it out and bring it on your tour. Outside the Duomo Point in via Arcivescovado 1. Please show up 15 minutes before the tour starts. The tour lasts 2,5 hours. Is there a dress code on the Duomo? The Duomo has a strict, but simple dress code: shoulders, abdomen and knees must be covered. Footwear of any kind (we recommend comfortable footwear), jeans are allowed. It is also not allowed to wear hats within the basilica. Please note that the staff in the Duomo will have the right to decline accepting you due the dress code above without any obligation to refund you for your tickets. - Please note that this tour is not recommended for pregnant women. - This tour is not wheelchair friendly. This tour operates from Monday to Saturday at 2.30 PM.